When we look at wrestling characters, especially ones from our childhood, we tend to look at them through rose colored glasses. I am a child of the 80s, started watching in 1987 at 4 years old. When I was a child, Hillbilly Jim was my favorite. Hillbilly Jim. The dancing southern stereotype. Yet still something about that song makes me smile, it’s the rose colored glasses, happy times from my childhood. Mr. Fuji is another example of this. He is memorable, and definitely part of the fabric of 80s WWF wrestling. But lets be frank, he isn’t really that great of a character…and kind of racist…. Making his eyes less Asian??? Mr. Fuji is important. He was one of the big three managers of the late 1980s. 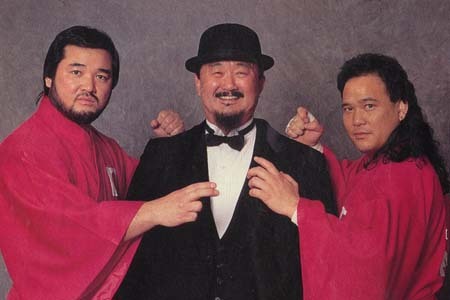 Fuji, Jimmy Hart and Bobby Heenan were the three families of the Golden Era of WWF, 1986-1991. The format was very WWF. They had done it before in the 70s with the Grand Wizard, Freddie Blassie and Lou Albano. Faction/family heels worked as a format. And the WWF/E has always been about formats. If it works, it will be repeated over and over again forever. When Freddie Blassie retired in 1984-85 from active managerial duties, he needed a replacement. WWF’s Managers were from two camps. They either were personalities who really were never wrestlers in their heyday, (Bobby Heenan or Jimmy Hart) or are former wrestlers. Fuji was that. 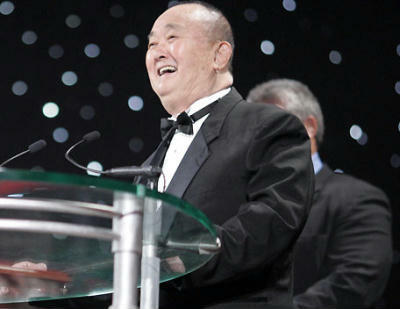 Fuji was a multi-time world tag team champion who spent the majority of his career with the old WWWF. He held the tag team championship 5 times in the course of 15 years. Apart from a few years in the late 70s away from Vince Sr., Fuji was a company man. He was a New York territory wrestler through and through. And if we’ve learned anything in our fandom, those who stick around, are generally rewarded eventually. To be one of the big three, one of the heel managers was always a big deal. The manager in the 70s and 80s was the person who the face feuded with. Hulk Hogan wasn’t feuding with Bundy or Orndorff or Andre, he was feuding with Bobby Heenan. Bobby Heenan feuded with Hulk Hogan for years and years. As it always was. The manager had a family of talent. And Fuji was no different. However, during his heyday he was mostly third tier. His list of talent is a who’s who of who the hell are you? 75% of the men he managed were undercard or jobber level heels. The Moondogs (in the mid 80s), Killer Khan, Sika, Kamala, The Berzerker, The Orient Express, Ninja Crush & my favorite The Powers of Pain. None of these men really had any memorable success in the WWF. They were there to look the part of a threat for a mid card face to overcome. Beat The Japanese Stereotype Team! Fuji was great in Fuji Vice, due to his willingness to look ridiculous. But there was one other reason he was good in those, and that reason in the summation of my entire problem with Mr. Fuji. He was funny because he couldn’t speak English. Mr. Fuji had a heavy accent and sounded ridiculous when he spoke. Realtistically how was this man a manager. A manager’s only job is to speak for those who don’t have the skills to speak for themselves. Fuji has an accent which makes him fairly non-undertstandable. What is he saying here? However, all my hemming and hawing cannot hide the success that Fuji had. He was the manager of Demolition, the longest running tag champs of the 1980s and also the only manager of the late 80s trio (Hart & Heenan) to ever manage a WWF Champion (Andre doesn’t count). These are successes and are the reasons Fuji is included. 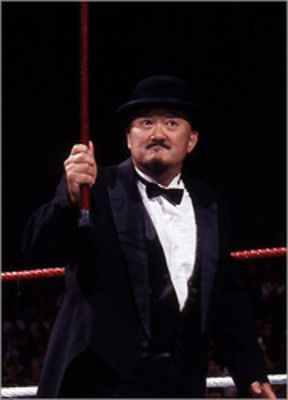 Mr. Fuji is a beloved character, and a real part of 80s WWF. Despite my quizzical huh about him as a manager, there is no denying his importance. 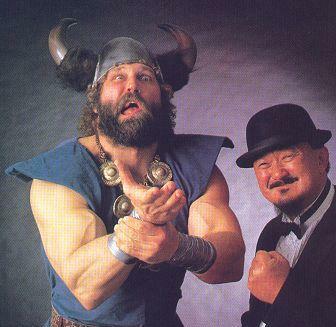 WWE started in 2004 with their managers, 04-Bobby Heenan, 05-Jimmy Hart, 06-Sherri Martel and 07- Mr. Fuji. If you are a semi successful manager in wrestling, eventually you will end up in the Hall of Fame. It is almost a guarantee. Expect Dutch Mantell, Paul Heyman, Jim Cornette and Paul Bearer to all be in the Hall at some point. The last of the 80s managers didn’t open the door as much as closed the door on his type. This allowed for later additions such as JJ Dillion, who were successful mostly outside of WWE. This entry was posted in 6 out of 10, Class of 2007, WWE Hall of Fame and tagged class of 2007, mr. fuji. Bookmark the permalink.